Camcorders come with a variety of different features, making it important to decide which features will be the most valuable to you before buying. Like all electronics, camcorders are growing in complexity but shrinking in size. This has increased the ways in which they can be used. Many action cams can live stream footage for social media, while some reasonably priced 4k camcorders create ultra-high definition video, showing the finest of detail. We performed extensive research to find camcorders that balanced performance and features with the purpose of use and price. Read more about our methodology. The Panasonic HC-V770 HD Camcorder’s solid construction, easy to use features, and excellent sound and video quality make it a standout. It runs quiet, which makes the built-in 5.1ch surround mic sufficient most of the time. Versatile and durable, the V770 can be used by both beginning and advanced users. The KINGEAR KG003 Night Vision Video Camera is compact and has good video and audio for a camcorder in this price range. It comes with a complete package of accessories that make it ready to use upon opening. Excellent 1080p resolution with 60 frames per second gives smooth, crisp video. Threads on the front lens allow for filters and additional lenses, giving this camcorder extra versatility. A well-tuned full auto mode and three image stabilization options make the R700 hard to beat at this price point. This camcorder is loaded with customizable features. Overall, it’s easy to use, offers two to three hours of battery life depending on the settings, and double slots for flash cards. The image stabilization compensates for the lightweight, making it ideal for long shoots. Small and durable with excellent image stabilization, this tiny camcorder packs a powerful punch. The housing is waterproof to 33 feet but can go deeper with an extra casing. It can be run remotely through a smartphone or the voice control feature for handsfree control. For a pocket camcorder, this little unit captures good images with a 1080 resolution at 30 frames per second. It comes with several different mounting options including a body clip, helmet side mount, and Velcro fixings. It also has a remote control. Most camcorders introduced in the last few years are high definition (HD) although there are still a few standard definition models available. HD resolution varies between 1280 x 720 pixels and 1920 x 1080 pixels at varying frame rates. An HDTV is required to view videos made with an HD camcorder at their full resolution. 4k video camcorders have trickled into the market, and their price continues to drop, making them accessible for home users. At 3840 x 2160 pixels, they have four times the resolution of a regular HD camcorder. However, that difference in resolution is only visible on an ultra HDTV. High resolution is great for capturing find details, but keep in mind, the higher the video resolution, the more memory and battery power the video will take. Flash memory is the standard memory format for camcorders. But models can vary as to what type they take and whether or not they have internal storage capabilities. Most camcorders store video on memory cards—Secure Digital (SD/SDHC/SDXC), micro Secure Digital (microSD, microSDHC, microSDXC), Memory Stick, or Memory Stick Micro. Internal, nonremovable flash memory cards are included with some camcorders with a capacity of 8GB to 96GB. Other models may have a combination of the two with internal storage and an exterior port for a memory card. Available memory will affect recording times and higher resolution video will take up for space on the flash card. Flip out LCD display, optical zoom, digital zoom, autofocus, 3D abilities, and built-in projectors are only a few of the features that are available on modern camcorders. Know what features are going to be the most beneficial to you. An autofocus feature is helpful for beginners who want to open then the camcorder out of the box and start filming. Wi-Fi capable camcorders make it easy to download video, and some allow for live streaming. Many Wi-Fi capable camcorders can also be remotely controlled from apps installed on a smartphone or tablet. For those who video outside in full sunlight, a viewfinder will make it easier to see in full sun than an LCD screen. A good place to start is to examine what you’ll plan to use the camcorder for most often, how long your videos are likely to be, and how much manual control you want to have. Under $300, are a lot of budget-friendly HD camcorders. Less well-known brands populate this price range, but there are some that have durable construction and produce good video. They usually lack features and audio can sometimes be sacrificed for price. 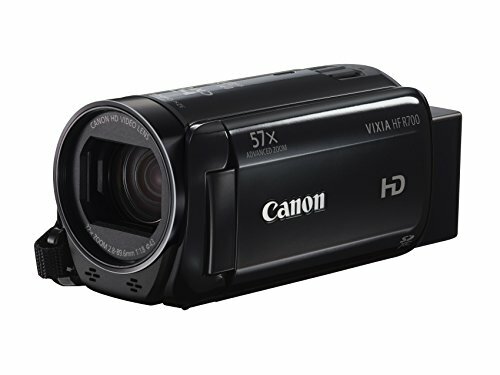 In the $400 – $800 range are full-sized HD camcorders with increasingly complex features. Top brand names like Sony, Panasonic, and Cannon have their family-friendly models in this range. Video and audio quality are excellent in this range with a few 4k models available. At $900 - $1,500, are pro-grade models with multiple auto and manual adjustments available. Multiple flash card slots, multiple plugins for external microphones, and increasingly complex audio and video adjustments can be made with these camcorders. At $1,600 and up, are professional cameras with impressive image stabilization, live broadcasting abilities, customizable preset controls, fine audio tuning, and more. 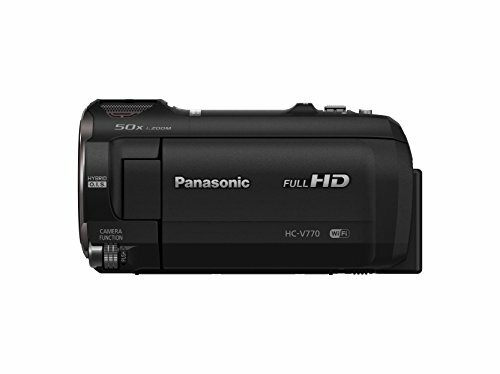 The Panasonic HC –V770 HD Camcorder offers solid audio and video for the price. It comes with a beginner’s manual with an advanced manual available from the manufacturer. A one-touch connection feature uses Wi-Fi to connect with a smartphone or tablet so you can start or stop video remotely. iA mode automatically sets white balance, shutter speed, sharpness, color saturation, and brightness for those that don’t want to adjust settings manually. However, when the iA is off, advanced users can make adjustments as they see fit, making this camcorder a good choice for a wide variety of users. High-quality construction. This camcorder has a durable outer casing with a well-protected lens. It also has an external microphone and headphone jacks and a built-in camera light. Automatic functions. iA mode senses lighting conditions and automatically adjusts settings. This is partly done through the BSI sensor, which suppresses noise in dim light. There’s also a level shot function that keeps the picture steady using one of three different modes – off, normal, or strong. Manual adjustments. For more advanced users, there is a dial that can manually adjust focus, white balance, shutter speed, iris, sharpness, color saturation, white balance fine, and brightness. Recording options. The V770 records in full HD at 120 frames per second. With the touch of a button on the LCD screen, it can switch to slow motion, recording at 240 frames per second. There are extra effects such as a miniature effect, 8mm movie, silent movie, and time lapse. Wi-Fi, remote control. A downloadable app is available to connect the V770 to a smartphone or tablet. The camcorder can be remotely controlled through the app. 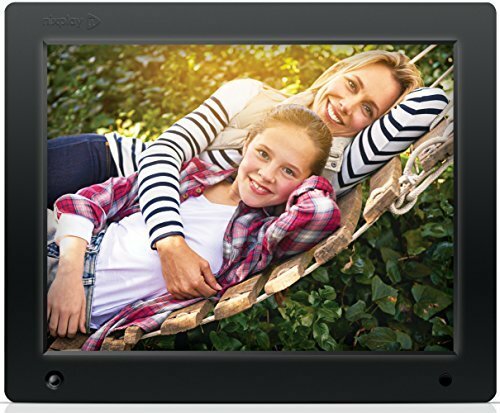 Videos or photos on the camcorder can be viewed through the app, making it possible to use the V770 as a baby monitor or to live stream content. LCD Screen. When the LCD screen is flipped, it does not show the recording time which may be problematic for those recording vlogs or livestreaming. White Balance. Even beginning users will want to learn how to adjust the white balance as it needs fine tuning out of the box. The KINGEAR KG003 Night Vision Video Camera is a lightweight camcorder that records in full HD. It produces excellent video with three video formats from which to choose. The KG003 has the basic features needed to shoot good video in most conditions including five white balance choices and a CMOS sensor to keep images sharp while cutting down on overall weight and price. Image quality. When it comes down to it, everyone wants a camcorder that records great images. The KG003 delivers with 1080p video with good compressions which means longer recording times. Keeping in mind that recording times will depend on what features are being used. Compact and lightweight. Small enough to carry in a pocket or bag, this little camcorder is easy to take wherever you go. It’s light enough for children to use without getting fatigued. Included accessories. The package includes AV and HDMI cables along with a camera bag, external microphone, battery, and user manual. Including the HDMI cable and external microphone saves money in the long run because both can be expensive add-ons. Night Vision. The night vision feature, not to be confused with infrared, is only so-so. While there are many good standard-definition camcorders, for video quality and longevity of the use of your videos, look for a camcorder with full HD capabilities. Camcorders in this category generally have a resolution of 1920 x 1080 or 1280 x 720 pixels. All HD models record in 1080i, which is the same resolution as high definition TV. HD takes up more memory space. If storage is a limiting factor, consider a standard-definition model. Entry level and occasional users will find camcorders that take good video and audio with a few extra features for convenience. The Canon VIXIA HF R700 Camcorder offers advanced features like Zoom Framing Assist in both auto and manual modes and five cinema effects to enhance your video. The LCD rotates 180 degrees so that you can see the shot even when standing in front of the camcorder. Canon’s optical stabilizer technology works well even when using the 57x zoom feature. The R700 has a unique baby mode that lets you capture and organize images for up to three children. Baby mode images are then stored in a special folder for easy access. This camcorder is ideal for a family looking for an affordable camcorder to use for years to come. Image quality for the price. 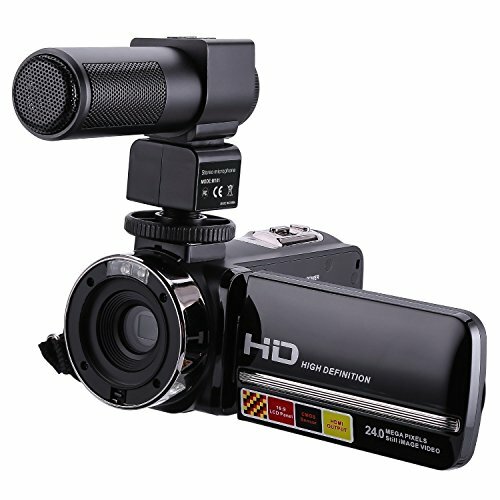 This camcorder gives the option of using either MP4 or AVCHD progressive. In ideal lighting conditions, even if the subject is moving fast, the image quality is excellent. Compact and lightweight. Camcorders have to compete with cellphones for portability. This small, lightweight camcorder can easily fit in a bag, backpack, or purse without adding too much weight or bulk. Full auto mode. The full auto mode really does take care of everything. The best part, it keeps the user updated with what it’s doing so you know what adjustments are being made in real time. Time-lapse. Custom speed time lapse video can save hours on battery life and storage space. Direct sunlight. The LCD screen can be tough to see in direct sunlight. Battery charger. There is no external battery charger. The entire camera has to be plugged in to recharge the battery. Pro-grade camcorders can have either 4K (ultra high-def) or HD resolution. That’s a resolution of 3840 x 2160 pixels for 4k models, which means fine details will only be seen on an ultra-high definition TV. The features of a pro-grade camcorder can include but are not limited to impressive optical zoom, better image stabilization, exposure control, iris control, and faster frame rates. Many also have attachable microphones or lights for better audio and video. These camcorders are for the advanced user or professional looking for adaptability, control, and excellent video and audio. 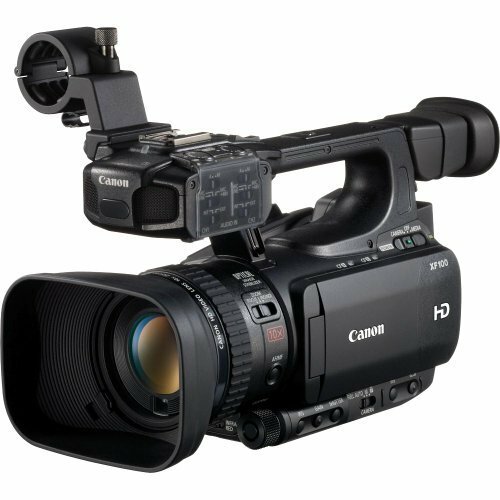 The Canon XF 100 Professional Camcorder has two CF card slots, switching from one slot to the next when the first becomes full. There is a separate SD card slot for storing photos. Audio buttons are protected behind a clear cover for a quick visual on the settings. There are ports for live broadcasts and two microphone plugins. Menus are navigated using a joystick, which helps when scrolling through the extensive list of options. A SuperRange Optical Stabilizer keeps images steady and clear. Image quality. This camcorder produces professional quality images with manual controls to adjust for adverse lighting conditions. With a codec of MPEG2 50mbs 4:2:2 color, colors are accurate and meet minimum requirements for BBC broadcasting. It does require some fine tuning with the white balance, lighting, and picture settings but, once set, it produces a clear, smooth picture. Joystick. Some users find this outdated, but when the menu is as varied and complex as this one, the joystick makes finding the right settings easier. The tedious work of scrolling is quicker and more accurate with this hard button feature. Audio options and protection. The audio controls are protected by a clear plastic cover. You can see the settings while in use, but the cover prevents accidentally bumping them. External microphones can be used in one of two microphone plugins. Custom settings. There are nine buttons that can be programmed with customized settings. This makes it easy to find the right settings for the conditions you film in the most. Storage and security. Files can be copied and backed up from one flash card to the other. The double slot recording allows simultaneous recording on both flash cards at the same time for instant backup. As soon as the record button is pressed, the camcorder continuously buffers three seconds of video memory to protect each shot. File formats. Files can be difficult to format, depending on what kind of editing software you use. Check that your editing software has a conversion feature to be sure files convert smoothly. Action/sports camcorders can be, depending on the model, worn or mounted while running, biking, hiking, snowboard, and swimming to capture action at its most intense. What they lack in features because of their small size, they make up for in durability. They have tough outer casings that are water resistant and protect during falls. Some use apps to connect to smartphones for a true hands-free experience. An action/sports camcorder is for those adventurers looking to capture the action as it happens. 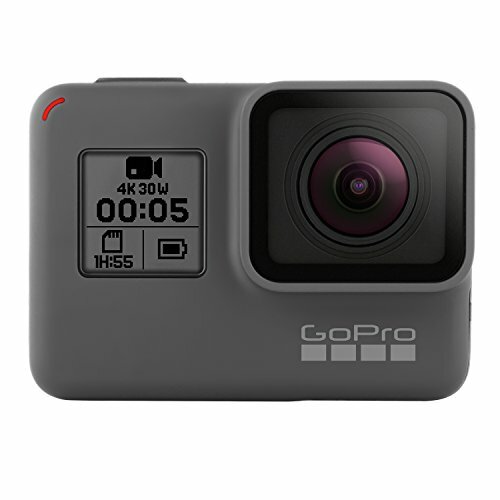 The GoPro HERO5 is a 4K camcorder producing the ultra high definition video many adventure seekers crave. The durable casing can withstand rough terrain and underwater use up to thirty-three feet. Image stabilization is good enough to counteract the effects of a bike ride and other outdoor activities. You can set up the perfect shot using a smartphone as a remote or the voice controls. It also includes a GPS feature to mark when and where shots are taken. Voice control. Voice control goes beyond remote control. It’s hands free, letting you set up shots that would be impossible to take on your own. This voice control feature has an excellent range. Wi-Fi. Connect and download video through a Wi-Fi. It also allows you to connect to the smartphone app or control the camcorder with an Apple watch. 4k. 4k video has four times the resolution of HD, capturing every detail. Mounting options. It comes with three mounting options—curved adhesive, flat adhesive, and a mounting buckle. Exposure control. Most action/sports camcorders don’t offer many manual control features. The GoPro HERO5 has exposure control with higher ISO options than previous models. LCD touchscreen. The touchscreen can be finicky, making it tough to scroll through menus. The touchscreen does not respond underwater, so the manual buttons must be used. Pocket camcorders are the size of a cell phone, making them highly portable. Their small size means there isn’t room for many extra features but that makes them easy to use. Most have touchscreen capabilities, which makes using the few features they have easy to navigate. They come in both standard and high definition, but their lenses are small enough that video quality isn't the best. If you're looking for a camcorder that is simple, small, and portable, a pocket camcorder is a good choice for you. 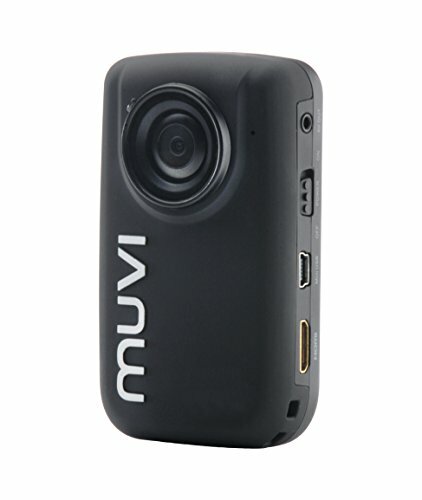 The Veho VCC-005-MUVI-HD10 Mini Handsfree Action Cam is only 3.2 inches long and 1.9 inches wide. For the size and price, this little camcorder takes some great HD video. When used in the 1080p mode, it can record small details like license plate and house numbers. The other recording modes lose some detail but can get a wider field of view. A remote control opens your options for use. This camcorder can be carried in a backpack or purse, mounted to a bike, dashboard, or helmet. For those who value portability and ease of use, this camcorder is a good choice. Image quality. Image quality is good enough to use it as a body camera. Battery life. When recording in 1080p, the battery will last for about two hours. On lower resolution settings, it can get up to as much as four hours of recording time. That’s not bad for such a small unit. Mounting options. Finding the right mount can be just as important as the resolution when it comes to pocket camcorders. This one comes with a flat mount, helmet side mount, body clip, helmet strap, and Velcro fixings. With so many included mounts, you shouldn’t have to buy a separate mount. Low light. Video quality goes down significantly in dim conditions.